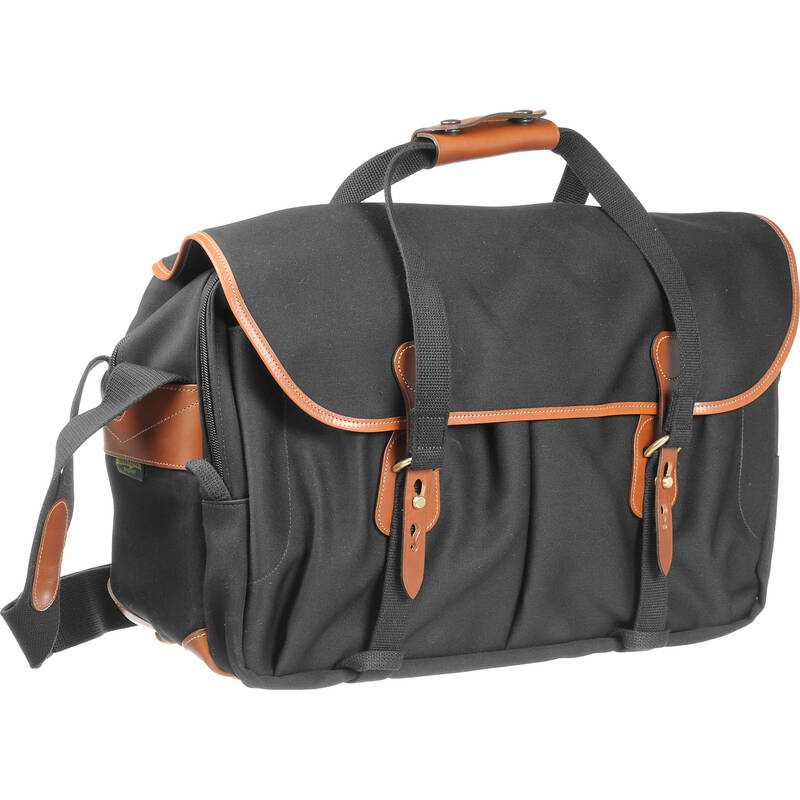 The 555 Shoulder Bag from Billingham is made in England and features black canvas with tan leather trim and brass fittings. It was designed to carry two to three DSLR cameras with several lenses and accessories. The case is constructed from soft-weave fabric which helps eliminate abrasions, a Stormblocker dual-laminate waterproof canvas, a heavy-duty, closed-cell, foam-padded interior and a double-laminated, removable hard bottom. It also has Superflex 10-15 and 10-18 partitions for separating and organizing the interior. The main compartment is framed internally with 4-ply Nytex binding. This maintains the bag's shape and helps to channel rainwater away from seams. The TukTop allows the main zipper, with its double pulls, to be tucked out of the way when opened. A Zippered compartment, located on the front exterior of the bag has sewn-in padded pockets, which can easily hold filters, additional cords, and connectors and also has a section for a notepad, paperback, news magazine, etc. Box Dimensions (LxWxH) 20.315 x 13.937 x 6.693"
555 Shoulder Bag (Black Canvas with Tan Leather Trim and Brass Fittings) is rated 4.8 out of 5 by 20. Rated 5 out of 5 by Zarathustra from Great big bag! This bag is awesome. I use it whenever need my cameras with me. I fit in my Nikon F3 along with two other rangefinders plus filters, film, passport, pens, you get the idea. I've gotten caught in the rain without a single worry about my equipment getting wet. It's also big enough to carry around a medium format camera + lens, light meter, film backs and a large rangefinder. The sides are all padded and the construction is quality. Mine came the shoulder pad which is crucial as the thing gets heavy when full. Now I want to get a smaller version for when I only need one camera! Rated 5 out of 5 by ROCHCH from Great Bag Really thought hard about buying this expensive bag. Very glad I did. Just got back from a 10 day hunting and photo safari in Namibia, Africa. Carried a Canon 300 , 70-200, 1.4 extender, 24-105, Body, Leica binoculars, Macbook pro, external hard drive, various chargers, batteries, cables and ballhead for a monopod. The back full length pocket was great for all of my documents. This bag was in and out of a very dusty old Toyota LandCruiser all day long. Things often got thrown on top of it. The exterior became dusty and dirty. Just kept outer flap closed and zippers zipped and the equipment never got dusty. I did not have trouble with the dividers that others have spoke about. One issue that can't be avoided is that with all that stuff inside it is heavy. Rated 5 out of 5 by Jaccobra from Fantastic Camera Bag I first became acquainted with Billingham while shopping in Freeport, Maine in the early nineties. Since then I have acquired a medium format bag, and recently the larger 555 series. Each of the bags, despite its age, have held up well, maintain their shapes, quality of construction is excellent. I see no reason why the 555 series should be any different. In my opinion, the bags have easy access, and plenty of storage for any type of gear I need to transport. The quality of these bags has not been compromised over the years. If I need another bag in the future, without hesitation, it will be a Billingham product. Rated 5 out of 5 by Raaveness from Functional and Stylish! This has to be the most attractive bag that I own. I was very impressed with the overall quality, and thrilled that I can safely tote 2 DSLR bodies, battery packs, flashes, filters, my computer,cords, and an array of lenses (4-6) - including my 50-500, which is a fairly sizable lens, any way you look at it. And, I still have room! An added blessing - because of how I can distribute the weight in this bag, I can still carry it!!! (I'm a small-framed female, 40, 5'6, 112 lbs., and out of shape since I fell off the fitness mission...) For me, this was an excellent purchase. Not only can I keep with me more than I need, there's room for extras, and I no longer struggle with the bulkiness and awkwardness that I have endured with my other bags that have comparable or less space. Rated 5 out of 5 by The Rock Doc from The most amazing bag you will ever own! FILMMAKERS TAKE NOTE: I needed a large bag that I could carry on airlines. Something to hold 2 large DSLRs with Z-finders attached, and 6 or 7 lenses. Having looked at the Tamrac, Lowepro, etc. locally I just was not happy with the quality. I kept reading about Billingham bags, but the price tag was a little daunting. But finally I bit the bullet and purchased one. From the moment I took it out of the B&H box I knew I had made the right choice. It looks and feels like no other camera bag I've ever seen. The inserts are amazing in how many ways you can reposition things until they're to your liking. Everything about the bag is exceptionally well made. Really, it's not even on the same planet as other bags. You'll smile every time you look at it. It's the Rolls Royce of camera bags. LOVE LOVE LOVE! Rated 5 out of 5 by Anonymous from Excellent quality as expected This my third Billingham that I currently own. I have a Hadley Pro for basic use (one camera, two lenses) and a 335 for carrying a bit more. This latest 555 holds everything I own and will be used on occasions when I need absolutely everything with me. Granted it's heavy when fully loaded. It's my fifth Billingham that I've owned over a lifetime. Once you use these bags it's hard to go back to anything else. Billingham and Domke are the only two brands that have served me well. The bags are built to last a long, long time. In fact they look even better as they age. If you've never used a Billingham give it a try and just be sure to spend some time with it before you make up your mind. It takes a while to understand the Billingham philosophy and way of doing things. But in the end, there's really nothing that can beat them for their overall value and longevity. Rated 5 out of 5 by Anonymous from Not cheap but an excellent product This bag is used daily for the following reasons. I keep my digital SLR camera, GPS, 15 laptop and paperwork in this bag. I basically use it as a briefcase. I just love the quality and attention to detail. It is a bit bulky for this purpose but you know the equipment is protect. The quality feel is just superb. Rated 4 out of 5 by Enormus from Expensively cool I travel a lot shooting annual reports and I have to admit that I have never been satisfied with any of the 12 or so camera cases I've purchased. I've had backpacks, roll-ons, large and small shoulder bags, fanny packs, you name it. They're either too large to fit under an airplane seat or they don't carry enough equipment. Some have way too many compartments so looking for stuff takes a great deal of time. I had a bag like the 555 years ago. It was sold by Leica and was plain canvas with leather straps. I loved it, but alas, I got rid of it 30 years ago. In this day and age of high-tech ballistics fabrics, Velcro, Nylon snaps, it's kind of refreshing to see a bag company that has not gone the way of Chinese made, substandard junk and who has kept up the tradition of canvas, leather and brass. This bag is all quality. It is very traditional, but still has high-tech padding material and construction. There is nothing shoddy about it at all. There are few pockets, and these are expansive and easy to reach. There is enough room for my MacBook Pro, my EOS 5D, 5 lenses, a Canon G10 and numerous accessories. The only thing I found confusing to set up are the individual padded compartment cells. There are no instructions with the bag as to how to set these up so that took a little trial and error. I still don't think they're in correctly. The leather straps and trim are beautiful and the sage color is very elegant. A very expensive bag, but in my mind, worth the price. Loaded - does it fit in an overhead bin on an airplane? I currently own two 555's, extremely great bags, laptop will fit if the bag is not crowded. However, I have a smaller Billingham that I store my laptop. binoculars, and incidentals in.